Spray cooling is a complicated process with multiple factors at play. One such factor is the Heat Transfer Coefficient (HTC), which itself depends on many variables such as spray shape, coolant flow rate, spray pressure, mold temperature, spray angles, and spray distance. In FLOW-3D CAST v4.2, a die spray model was developed in collaboration with Audi, where the HTC was computed by a series of spatial dependence factor functions in order to capture the effects of all these variables. However, it is often the case that the user doesn’t know the value of these dependence factor functions. A new, simpler way to calculate the HTC has been developed in FLOW-3D CAST v5.0, which is based on known or easy-to-obtain spray medium properties. In this blog, I will talk about the new HTC calculation method followed by an example and a validation. 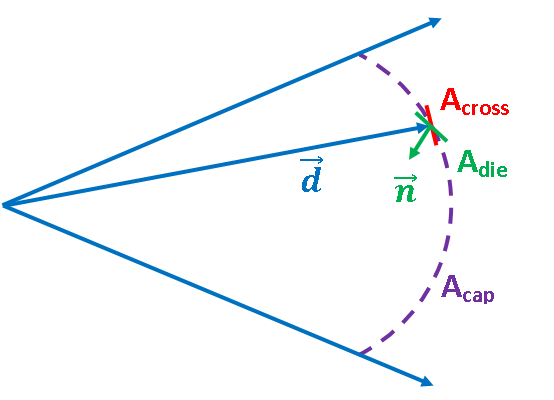 This equation shows us that the dependencies on the die temperature, the spray distance and the spray angles are included in the calculations, making the calculations more realistic and accurate. When the die temperature is above Tevapo +τT, due to the advection of the air and spray medium moisture, the HTC is kept as a constant value. This thermal die cycling simulation demonstrates the capability of the spray cooling model with the new HTC calculator, and the importance of accurately simulating the die spraying process. The animation below shows the simulation results of the production of a vehicle structural part with large dimension and thin wall thickness. In this example, the simulation is limited to the ejector part of the die. Animation showing the spray area on the die surface during spray cooling and the die surface temperature at the fifth cycle of spray cooling. 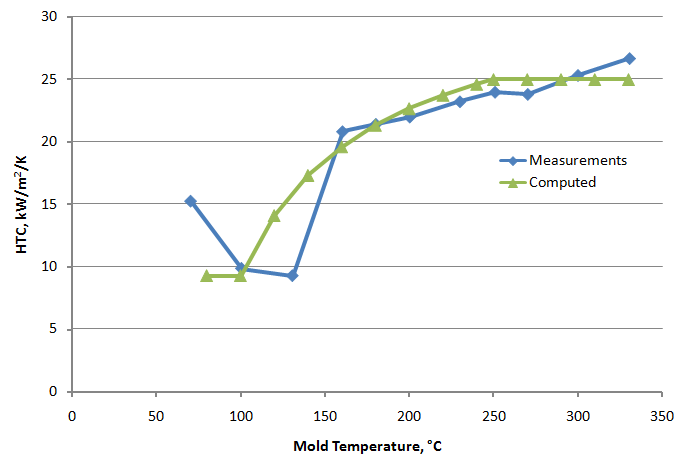 A comparison between the measured data (courtesy of Audi AG) and the computed value at the center of a spray cone as a function of temperature shows that the HTCs computed match well with the measurements. HTCs based on spray medium properties provide an easy and convenient way for defining accurate HTCs for the spray cooling process and allows our users to avoid difficult and expensive measurements.